A Simple Act of Violence is a book of two parallel stories, with the link between the two clear from the outset. In Washington DC a woman called Catherine Sheridan is killed. Police, in the form of Detective Robert Miller and his partner Al Roth, believe she is the fourth victim of a serial killer known as ‘The Ribbon Killer’. The second story thread is told from the perspective of the person we are to assume is the killer, a man named John Robey. In a series of (long-winded) chapters he talks about being recruited to the CIA and his his work for them in Nicaragua and other hot spots. One of his fellow CIA agents was Catherine Sheridan. This book recently won the Theakston’s Old Peculiar Crime Novel of the Year for being among other things ‘fascinating and surprising’. Do you ever wonder if you’ve read a different book from the one others are talking about? That’s how I feel about A Simple Act of Violence because I found it about as fascinating and surprising as breakfast. In audio format the book is nearly 19 hours long (500+ pages in its printed versions) but there is a startling lack of action for such a long tome. 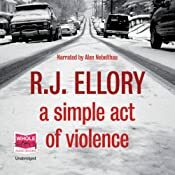 As far as the serial killer thread goes most of the victims are already dead by the time the book starts and we spend a chunk of time following Miller and his precinct buddies as they wander aimlessly down one dead-end after another. The few plot developments that do occur are telegraphed so far in advance that by the time they finally happen you think you’ve already read that portion of the book. The traditional narrative chapters are interspersed with chapters where John Robey tells us everything wrong with American foreign policy from the 1980’s onwards. I’ve read text books that were more compelling than these parts of the book. Not only is the content old news, effectively a re-hashing of the Iran-Contra affair and events surrounding American’s involvement in Nicaragua, but the story-telling method is dull and unbelievable. In my experience people do not lecture each other in day-to-day life but in John Robey’s experience everyone he met pontificated or lectured about something. Including people he was about to kill. Real people do not have the kinds of conversations that happened repeatedly during this book. It reminded me of those TV police dramas where two professionals who would both know exactly why a test is being conducted and what it will or won’t prove nevertheless explain the whole procedure to each other in words of two syllables or less because the writers can’t work out any other way to let viewers know what is going on. To top it off there wasn’t a single interesting character in the book. Miller is an unmarried cop who’s had a nasty experience where his credibility was questioned. Ho hum. He wasn’t an alcoholic but most other cliché’s were covered. His sleepless nights, friendless days and obsession with a single case have all been done before and there was no new angle or character depth here to make me care whether he got some sleep, made a friend or found the killer. Nobody else, including the pontificating Robey, was any more engaging or believable to me. In the end it felt to me as if this book didn’t know what it wanted to be. It didn’t have enough pace or twists to be an old-fashioned thriller, nor did it have enough heart to be a political exposé pitting one man against his government. I wish I’d read a “fast-paced thriller, each page…[bringing] about a new twist…” but I read a slow and largely predictable novel about people I will not be able to remember this time next week. This entry was posted in book review, R J Ellory, USA. Bookmark the permalink. Bernadette – Thanks for this review. It doesn’t matter that you’re in the minority; it’s a thoughtful and detailed discussion of the book. Your fine reviews are always so helpful to me as I figure out what I want to read, and this one’s no different. I haven’t read this book, but I also feel sometimes that I must have been given a spoof edition of a novel that everyone else is raving about. I find sycophantic reviews and blurbing about fairly average books rather annoying, and it always a pleasure to read your honest appraisals. I wonder in this case if the make up of the judging panel [from the BBC and Guardian] might have influenced the decision. The once high standards of the BBC have fallen so far that on Newsnight last week they had a caption which read “Isle of White”; instead of Isle of Wight. So glad to read this honest review. It certainly helps me to know that I won’t be reading this book. However, my TBR list has grown lately because of your fine reviews (and I’ve been reading the authors’ entries on this blog, too) and they are so helpful to me in figuring out what to read. Oh dear, I wish I hadn’t bought it, now. I have read so many raves about it, but I have wondered all along whether this is for me (which may account for why I have not read it yet). Child 44 is another one in this category – it is there, on the shelf, accusingly looking at me…..yet I can’t bring myself to start it. Sigh. @Norman – Isle of White? I am speechless. I really did want to know what the fuss was about with this book which is what kept me reading/listening. But it was not to be. Then again, life would be dull if we all enjoyed the same things. Yes. It always boggles me brain but expands it, too, to find out the varying tastes of readers. But it does help me to read others’ reviews because I do get a sense of whether or not I want to read something. Personal taste is an enigmatic thing. I have a phrase I use in my head for books where some chapters are told in first person by the killer: Psycho-in-italics (since, almost inevitably, the text of the killer’s narration is in italics). Whenever I pick up a psycho-in-italics book, it has about two chapters to make me a believer. If not, to the Friends of the Library sale it goes. Thanks for saving me the time it would have taken to read two chapters of this book. Not my cup of tea at all. Re the Isle of Wight: On CNN Headline News (in the States) just a couple of weeks ago, the news reader made reference to an English celebrity going to the “Isle of Wit.” If only, I thought to myself. Bernadette, I read your review with pleasure! And I know why R. J. Ellory’s book won the Theakston! It’s a voter award! Roger appeared at the Nordic, euro, Irish, etc. (NBIE) thread at Amazon US and found some friends. About 2,000 of them voted for him! Now I know I won’t read it: No dice to books which start with chapters from the psychopath’s viewpoint or which alternate italicized chapters from the killer’s thoughts with those of the detective or crime solver. No way. Thank god I found this website. I started reading about the awards after I read the book. I wondered, what’s wrong with me; they gave it awards. Yes, I enjoyed a few of John Robey’s rants because of my politics, but then found myself skipping chapters when he was telling his story. I kept wondering why did they batter those women so horribly. He loved Catherine, and then he battered her after he killed her? Oh, he skipped her face. How nice. Oh, he wanted it to look like those other serial killings. And why? I guess I missed something. And yes– you are so right– what a boring cop. A couple weeks later I couldn’t remember a thing about the cop. My first post ever on a blog and it’s for writing that I totally agree with your review! I won’t go as far as saying that it was a pain in the … for me to reach the end of this book, but I really got to force myself. So boring to read again, and again and again the same story stelling by detective Miller. Like if I’d forget what was written ten pages before, and also 30 pages before! This book is about repeating every action (maybe it’s because there aren’t many of it?) three times by each character! Hi Bernadette. I’ve just read this book and enjoyed it. I have written my review (fortunately!) and was looking for links for other reviews to link my post too. It’s great to read reviews that saw the book in a completely different to your own – one to disagree on I think!